December description: We’ve made our list and checked it twice. 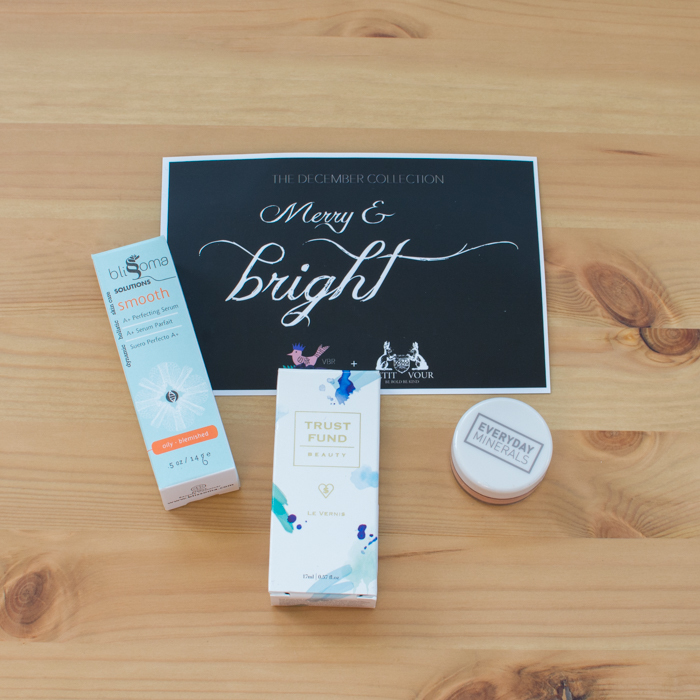 Celebrate the season in the kindest fashion with our December gems, chosen for you by Vegan Beauty Review. From everyday to holiday, we’ve got just the sort of thing to get you guessied up for snow days and soirées. Oooh! Merry Christmas to me! This box is so good! A new-to-me vegan nail polish, serums, blush, and deodorant! Description || INDULGE YOUR SKIN: Blissoma is the elegant marriage of herbal form and function, created by the explorative mind of a scientific artist. When right brain meets left the result is botanical innovations that really work. Made with active, potent ingredients that are based on nutrients, antioxidants, and advanced phytochemistry. Instructions: Gently spread over face and neck after cleansing and toning. May also be used throughout the day as a spot treatment. This serum is on my list of things I want to purchase. It felt good on my face and anything that maintains or reduces my natural cheek redness is indeed A++ in my book. And this serum definitely reduced. Smooth A+ serum is oatmeal-colored and had a light herbal scent. I enjoyed using it morning and night. Description || GET CHEEKY: This pretty shade has bright peaches and corals to give the perfect warming glow. 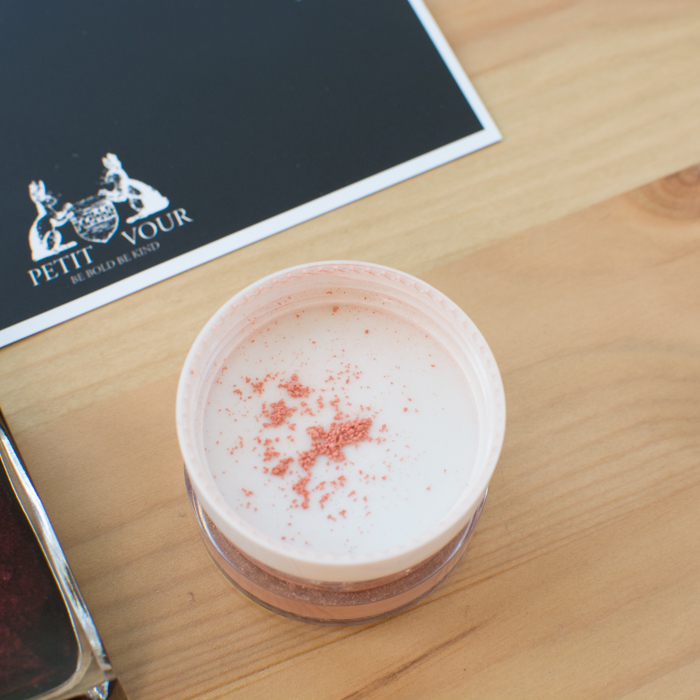 HOW: sprinkle blush powder into the lid of the jar. Use your brush to sweep the minerals along your cheekbones. Blend in an upward and outward motion. Blush also creates a radiant look when applied to your chin and forehead. All Smiles is a gorgeous summery coral and it looked great on my fair skin. I was disappointed to find out it’s a discontinued color, but in good news they do have several other coral toned blushes in their cabinet. On the plus side this should last me awhile anyway. Description || SMELL GOOD: Organic coconut oil combined with baking soda is antibacterial with a sweet and pleasing aroma. Arrowroot powder and clay will help to keep you dry. Gently rub a dime-sized amount into each armpit with your fingertips. For best result, shave at night and apply deodorant cream in morning. After my homemade deodorant this is my absolute favorite natural cream deodorant!! It’s not too stiff to work with, the scent is light, but present, and it doesn’t burn—even applied after shaving. Description || DECK THE NAILS: Feeling a little snarky? 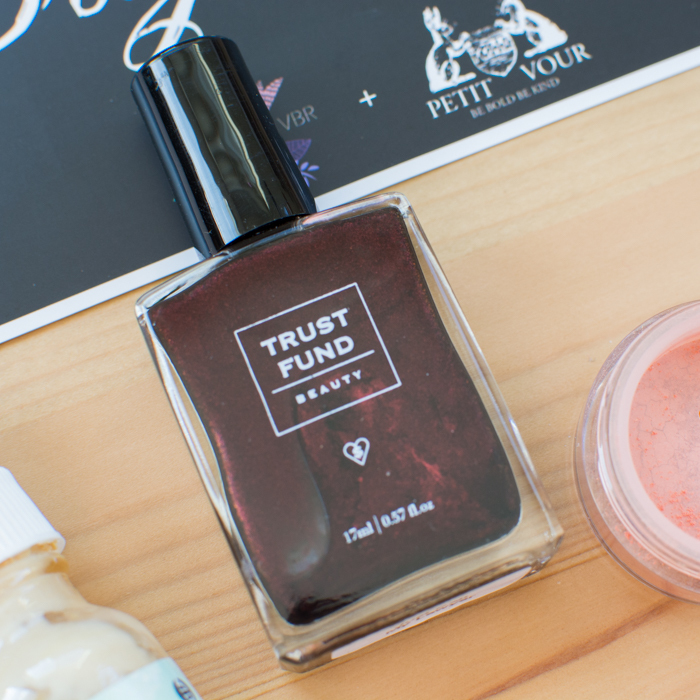 Let your nails live lavishly a la Trust Fund Beauty, our go-to line for tongue-and-cheek humor and luxurious performance-driven polish. Apply 2 coats and top with a clear gel coat for extra long wear. First of all go follow their IG account. It is by far one of the funniest, snarkiest, and lovely companies to follow. Just Talk to My Lawyer is a deep burgundy red with gold shimmers. It’s lusciously long-lasting.